Abu Shadi (Mohammad Bakri) is a divorced father and a school teacher in his mid-60s living in Nazareth. After his daughter’s wedding in one month he will be living alone. Shadi (Saleh Bakri), his architect son, arrives from Rome after years abroad to help his father to hand-deliver the wedding invitations to each guest, which is the local Palestinian custom. As the estranged pair spend the day together, the tense details of their relationship come to a head challenging their fragile and very different lives. Palestinian filmmaker Annemarie Jacir has written, directed and produced over sixteen films. Her short film LIKE TWENTY IMPOSSIBLES (2003) was the first Arab short film in history to be an official selection of the Cannes Film Festival and continued to break ground when it went on to be a finalist for the Academy Awards. Her second work to debut in Cannes Un Certain Regard, the critically acclaimed SALT OF THIS SEA (2008), garnered fourteen international awards, included the FIPRESCI Critics Award. It was the first feature film directed by a Palestinian woman and Palestine’s 2008 Oscar Entry for Foreign Language Film. WHEN I SAW YOU (a New Wave release) won, among other awards, Best Asian Film at the 63rd Berlin Intl Film Festival and Best Arab Film in Abu Dhabi FF. It was also Palestine’s 2012 Oscar Entry. Notably, the film’s production was entirely Arab‑financed with all Palestinian producers marking a new trend in Arab cinema. What’s most impressive is the way Jacir reveals these complex intertwining backstories through apparently incidental interaction. With a superb lightness of touch she uncovers the ancient hurts with which these characters wrestle, laying bare the raw nerves beneath the polite smiles...a film of surprising warmth and generosity, which takes a situation riven by discord and turns it into a melancholy song of resolution. "Annemarie Jacir’s comedy-drama interleaves simmering tension in the Israeli town with moments of terrific humour." 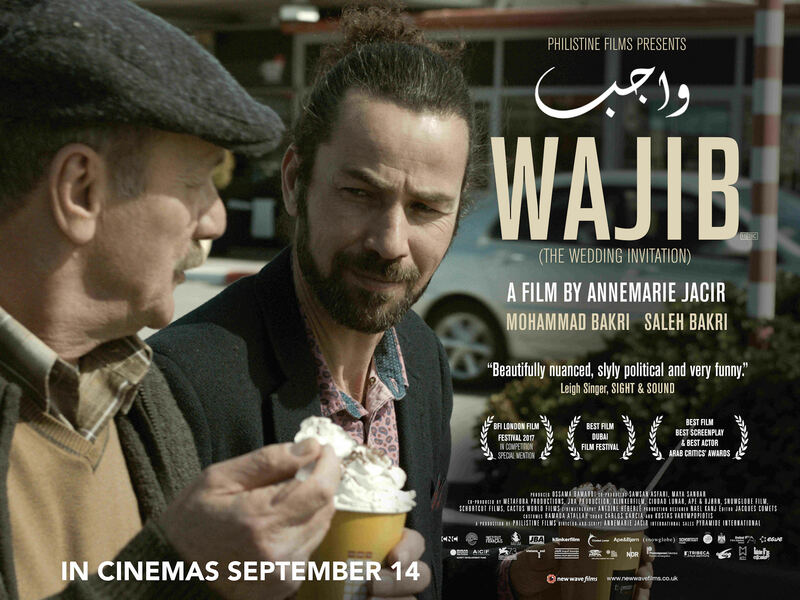 This funny-poignant Palestinian “road movie” trundles down every known or imaginable street while giving the sardonic, critical welly to ethnic and political tensions. "Quietly compelling drama...eye-widening look inside a Palestinian family." 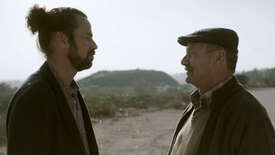 "Annemarie Jacir's inner-city road movie sees this duo (winningly played by real-life father and son Mohammed and Saleh Bakri) spar over matters both serious and trivial. Even as Jacir ably explores faultiness of politics, culture and tradition, she delivers a wryly affectionate odd-couple comedy. " "This is expert filmmaking from Annemarie Jacir, now a veteran of the art house festival circuit. 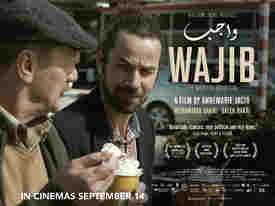 A story of fathers and sons, East and West, progression and conservation, Wajib intelligently explores the tensions within an Arab family living in contemporary Israel."